Home/Posts/Research Insights, Factor Investing, Value Investing Research, Momentum Investing Research/Factor Investing Fact Check: Are Value and Momentum Dead? The “stock market,” at least as measured via the S&P 500, has been on an epic performance run — especially relative to almost all asset classes. It doesn’t matter whether you look at the other asset classes by geography (e.g., US, developed, emerging), style (e.g., value, momentum), or type (e.g., stocks, bonds, commodities), one thing is clear: the S&P 500 is king. Below is a chart of the “Ivy 5,” which is a simple way to view asset classes (made popular by Meb Faber). 5-Year total return performance is from 10/1/2013 to 9/30/2018. The problem with all of these statements is that the S&P 500 (a.k.a., mega-cap U.S. stocks) has beaten essentially every investment style and every asset class on planet earth the past 5-years. While these statements are correct on the surface, the implications are misleading. The S&P 500 gives you mega-cap beta exposure. Owning mega-cap stocks was the way to go over the last five years. Implication: Market-cap weighted looked great relative to equal-weight portfolios and/or non-mega-cap portfolios. Momentum (e.g., past 2-12 relative strength) is not dead. Implication: No indications that momentum should be abandoned. Value (e.g., high book-to-market) looks dead in large-caps, but hope exists for smaller stocks. Implication: Investors with large/mega-cap-focused value exposures may want to consider a change. Here is a plot from our visual active share tool highlighting the distribution of exposure for the S&P 500 (as measured via SPY holdings) and the total US Stock market (as measured via Vanguard VTI holdings). The X and Y-Axis reflect market capitalization. Holdings of each ETF are percentile-ranked against the universe on market cap and plotted below (100% = AAPL, AMZN, MSFT type stocks; 0% = things you’ve never heard of). I think that image does a pretty good job of confirming our first fact: The S&P 500 is clearly a strong active bet on mega-caps. All returns throughout this piece are total returns and include distributions. And that takes us to our last two questions. Are we in a new world where growth and mega-cap beta have killed momentum and value investing? The Interaction between Size and Factors. Lu Zhang and his colleagues have a recent paper on replicating anomalies, which highlights the importance of controlling for size when reviewing various factor anomalies. The key point is that factors act differently (and often much better) outside the mega-cap stock universe. As we’ve covered though, over the last five years U.S. large-cap beta has crushed just about everything. Over the long-haul, mega-cap value beats growth (by a bit) and mega-cap winners beat losers (by a lot!). 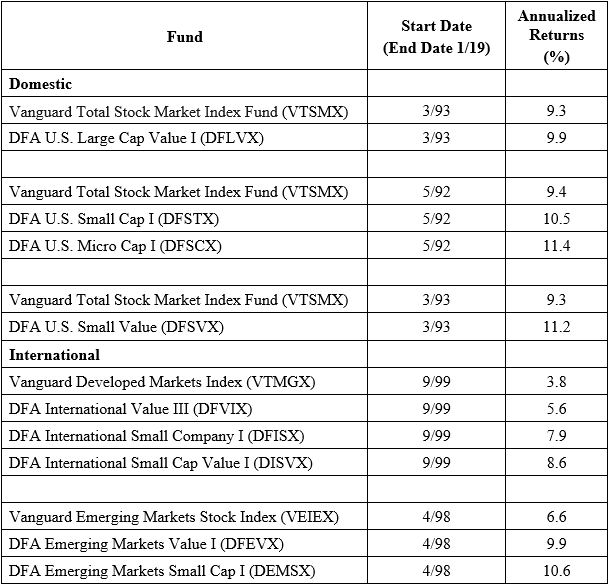 At the outset, we mentioned that the S&P 500, from a factor investing perspective, is a mega-cap beta fund (and one could argue it also has growth/momentum tilts). Mega-caps crushed the competition, and if you had growth or momentum exposures on top of your mega-cap exposures, you were essentially unbeatable. But what if we look outside of the mega-cap world? So after controlling for market-cap exposures the “factors are dead” argument doesn’t seem to be very compelling. Hooray! We’ve proved our last two facts from above. But…there is another obvious point here worth highlighting — everything is dead when compared to the S&P 500! If one compares the 5-year (and even 10-year) performance of small-cap value and momentum against the S&P 500 (or closet indexing vehicles that essentially mirror the performance), an interesting story reemerges: factors stink. Conclusion: Large beat small across the board and value was beaten up across the board, save small-caps. Conclusion: Large beat small across the board and momentum worked across all size buckets. The intent of this piece is to give readers a more nuanced view of common investment factors and how they have fared relative to the so-called “market,” which is often considered the S&P 500 Index. Long story short, everything has looked poor relative to the S&P 500. The S&P 500 delivers exposure to mega-cap beta, an exposure that has crushed almost all other asset classes the past five years. We also identified that momentum is not dead and has shown promise in both large and small caps. 1. ↑ albiet a risky bet, ex-ante! 2. ↑ Ken French’s website:Link to data here and link to details here. Large could be considered mega-cap as well. The cutoff for market caps is the 80th percentile breakpoint based on NYSE stocks and the portfolios are market-cap weighted. The portfolios, which are constructed monthly, are the intersections of 5 portfolios formed on size (market equity, ME) and 5 portfolios formed on prior (2-12) return. The monthly size breakpoints are the NYSE market equity quintiles. The monthly prior (2-12) return breakpoints are NYSE quintiles. Below is a chart of the past performance from 1963 to 9/30/2018 on generic large value and large growth portfolios from Ken French’s site: Ken French’s website:Link to data here and link to details here. Below is a chart of the past performance from 1963 to 9/30/2018 on generic small value and small growth portfolios from Ken French’s site:Ken French’s website:Link to data here and link to details here. 4. ↑ I’m secretly trying to play psychology tricks on the market and hoping that by claiming that value is dead, it will stage a reversal!